When and where will the C.I.A. stage the false flag operation in order to justify an unlawful US invasion of Syria? This post was predicated on the fact that the MSM is baselessly going after Assad again. The British press is predicting another false flag chemical attack in Syria which they state is currently in the works. 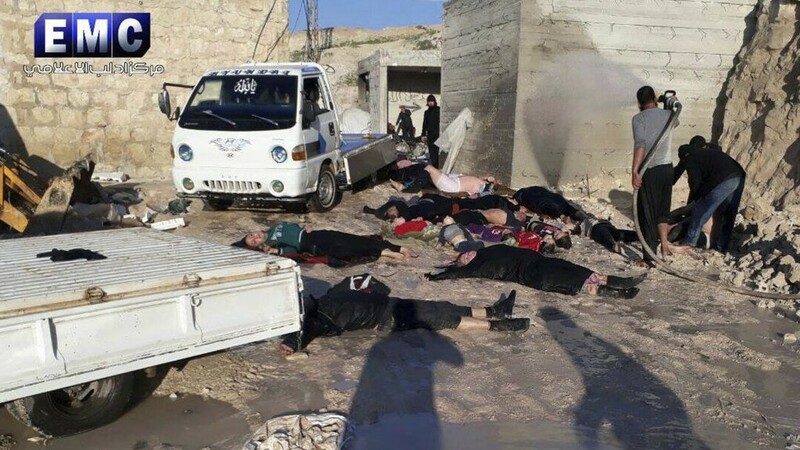 The mainstream media — both in the US and UK — has colluded in putting out fake news about ‘another’ Syrian government-directed gas attack on civilians even though they have never executed one. The hostilities are getting very serious in view of the U.S. Air Force being recently banned from Syrian airspace by Russia. Battleground communication between the two superpowers has also been cut off. The article posted below clearly spells out the only remaining alternative for the Western warmongers. The US, UK, Israel and Saudi Arabia are quite desperate to tear up the regional geopolitical chessboard known as the Northern Levant. They engineered the fake Syrian Civil War explicitly to rearrange that chessboard in their favor. However, now that Qatar has left the reservation for good their desperation only grows by the day. The whole Middle East is now a tinderbox that can blow with the slightest provocation or false flag attack. And the psypchopathocracies of the West do not care in the least about how big of a conflagration results from their unending machinations. SOTN is just finishing a piece on how Trump’s foreign policy has been completely hijacked by the Neocon Zionists. The rapidly devolving situation in Syria shows how. As usual, it’s either the US Ambassador to the United Nations or the US Secretary of State who carries water for the Neocon warmongers. In the instant case, Nikki Haley was purposefully appointed as the “golden girl” of the Neocon Zionist cabal. How often have the American people seen a woman or person of color in power used to fan the flames of military conflict? The Neocons are experts at manipulating their chosen surrogates to start their unprovoked wars of aggression to advance the Greater Israel project. Let’s see, there was Jeane Kirkpatrick … Zalmay Khalilzad … Madeleine Albright … Janet Reno … Colin Powell … Alberto Gonzales … Condoleezza Rice… Barack Obama … Susan Rice … Hillary Clinton … Samantha Power … and now the Indian American Sikh Nikki Haley who were all put in their high positions specifically to instigate war. What follows is Haley’s latest threat to Syria, and Russia, and Iran. It really does appear that the manufactured Mideast crisis is destined for a military resolution of epic proportions. Many have described this ever-present predicament as one of biblical proportions now that the Holy Land of the Northern Levant resembles “a dystopian, post-apocalyptic wasteland”. Others have written about the grave possibility that the final Battle of Armageddon will be fought at Tel Megiddo located in Northern Israel, which is just down the road from Damascus, Syria. In any case, the Trump administration has made many moves which indicate an inexorable push to war, not the peace that the POTUS promised repeatedly during his campaign. If this ongoing foreign policy blunder is not reversed post-haste, the Trump presidency will be doomed. And, Trump will go down in history as the biggest presidential failure of this Third Millennium (and that includes George Bush and Barack Obama). N.B. The following post by The Millennium Report provides some excellent context for better understanding the bigger picture. At the end of the day, it always does comes down to the establishment of Greater Israel. Is The British Media Spewing More Blatant War Propaganda Against Syria To Justify U.S. Invasion? The following article published today by the BBC reeks of war propaganda and transparent falsehoods. It’s only purpose must be to set up the justification for an invasion of Syria by the U.S. military and its allies. The American invaders have already been frozen out of key battlefields in the Syrian theater of war and are itching to fabricate a false pretext to get back on them. After shooting down a Syrian warplane over its own territory, Russia seriously warned the United States: that any such incursions in the future would be met with immediate force. ACT OF WAR: Why is a U.S. F/A-18E Super Hornet shooting down a Syrian warplane near Raqqa? The Russian military is operating in Syria at the request of Syrian President Bashar-al-Assad. The U.S., on the other hand, is considered to be a foreign warmonger which has repeatedly attacked the sovereign nation of Syria since the beginning of the conflict. 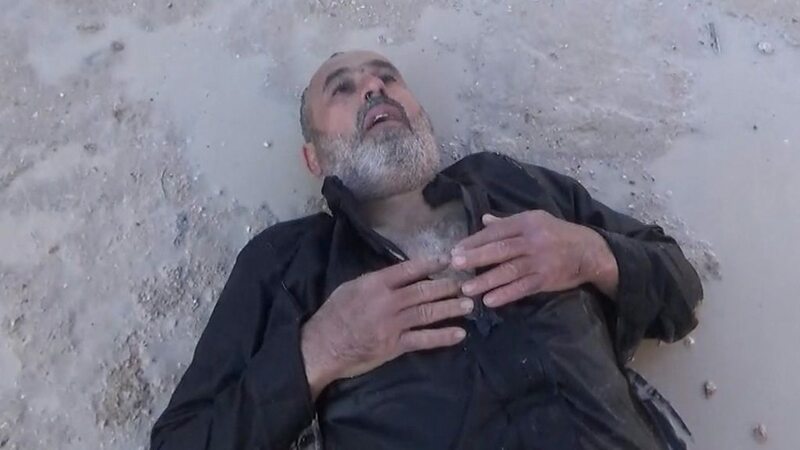 The primary means by which the US coalition attempts to stay relevant in this CIA-engineered war is by contriving fake gas attacks which are then blamed on the Syrian government. This type of stratagem is routinely coordinated and executed by the American, British, Saudi and Israelis co-conspirators. They formed the phony White Helmets in order to facilitate these false flag operations. By continually running the Daesh-perpetrated acts of terror in the daily news cycle, populations everywhere are kept in the state of fear. In this way governments around the globe are empowered by their citizenries to maintain their perpetual war economies. The main ZAAA stakeholders in this war against Syria will stop at nothing until Assad is removed from power. The high priority Greater Israel project cannot be completed with an independent Syrian president like Assad in office. Hence, the world community of nations will continue to witness this unlawful war until a Western puppet government has been installed in Damascus. The Anglo-American Axis is represented, first and foremost, by the major English-speaking countries of the world: USA, UK, Canada, Australia, New Zealand and Israel. The European member nations of NATO, such as Germany, France, Italy, Spain, Portugal, Belgium, Luxembourg and the Netherlands are also closely aligned with the AAA as are all the Scandinavian countries. So are the Asian Pacific Rim nations of Japan, South Korea, Taiwan and the Philippines. Saudi Arabia, Turkey, Egypt, Pakistan, Kuwait, Jordan, Bahrain, United Arab Emirates, and Qatar also owe their allegiance to the AAA but some of these may be changing (shown in red). The World Shadow Government is an ultra-secret, supranational organization which completely controls the Anglo-American Axis, as well as the European Union, NATO, among many other institutional entities which constitute the Global Control Matrix. The US says Syria’s government appears to be preparing for a chemical weapons attack and has warned that it will “pay a very heavy price” if one takes place. His close ally, Russia, meanwhile said an air strike had hit a rebel depot full of chemical munitions and released toxic agents into the air – a claim that rebel factions and the Western powers which back them have dismissed.